How do we protect ourselves from the underground element of the internet? It seems that they have free rein to do as they please without punishment; due to legal jurisdiction, legal costs and the sheer number of them, that will have you chasing them all over the world, which is a waste of time. My blog on Masthead has been lifted and placed on other sites as content without my authorization or payment to me, for that matter. 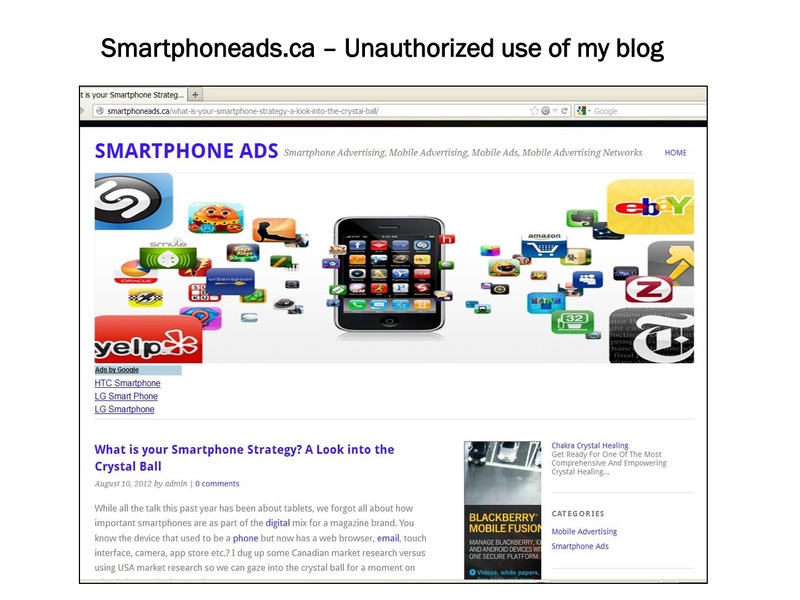 Here is the latest example of my blog being used on a Smartphone site in Canada. I have tried to have it taken down and my inquiry went ignored. The only way to get results is perhaps to expose them on my blog and advertisers will know that they are unethical and they will get blacklisted. Cyber crime comes in many forms. When I was in Ottawa in August, my friend received a message, “You just won an Apple iPad.” He did not remember entering into a contest. This is a good way to steal your identity or scam you to pay a shipping fee for the product that will not be shipped. I told my friend to ignore this, as it is a phishing scam. The latest trick that fooled me was a LinkedIn email that said I had one email message, but when I clicked on the link it went to a Canadian pharmacy site. Another popular phishing scam is from a bank asking you to verify your account information, now you know why banks don’t use email to talk with customers, which is kinda sad for real customers. Always double-check the link before you click on it to see if it is legit. You might end up downloading a virus that will infect your machine with what is called malware, and it will force you to take it to a technician at $80+ hour or scam you to buy fake anti-virus software that will not work — and now they have your credit card number and ID. 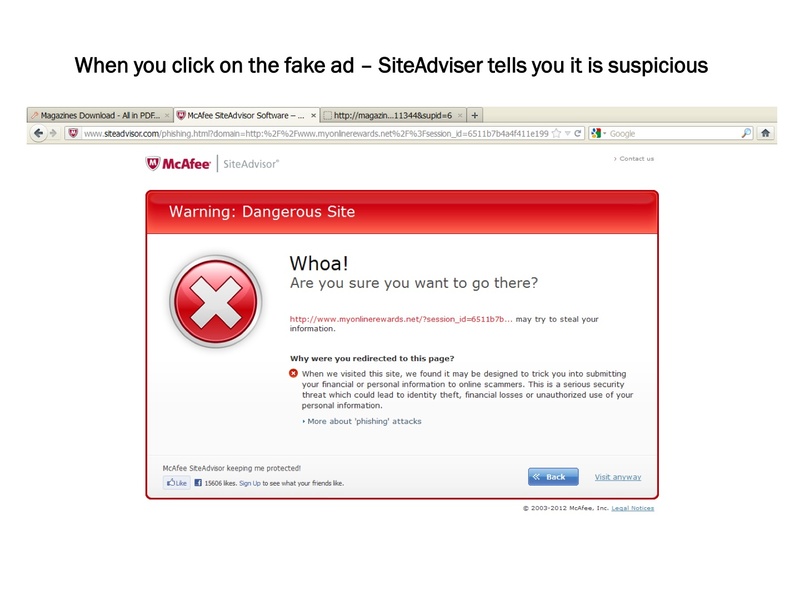 Ryan Winsborrow from Nerds 4 Hire recommends that you use SiteAdvisor that will identify malicious links and to use an anti-virus such as AVG or Microsoft Security Essentials, which are free to use. Ryan says there is no software that provides 100% protection, believe me, I have tried with the help of Nerds 4 Hire. Malicious links are everywhere and my kids using our Windows desktops were hit several times, and each time it was different as the approach is always one step ahead of the anti-virus makers. The magazine industry has not been impervious to scammers; I was told about a site that has pirated digital versions of magazines. 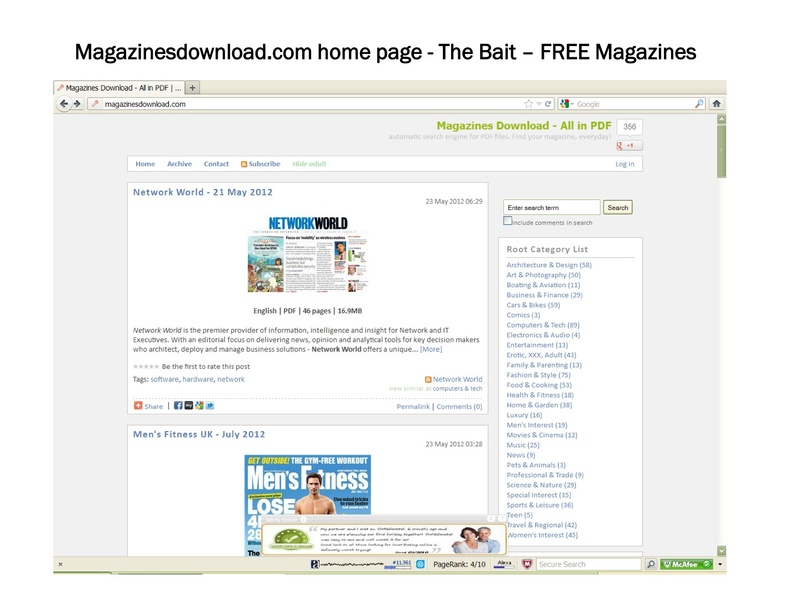 The site, www.magazinesdownload.com, offers "free" PDF downloads of magazines. They are using the bait-and-switch tactic that has been around forever, but now it is online. This site has lots of traffic as Alexa.com ranks it globally at 13,754, which I estimate it has traffic of over 500,000 visitors per month. According to GoDaddy, Volodymry Kotylo is the contact and is based in Lviv, UA (Ukraine). I attempted to contact them via email, but I have yet to receive a reply. Below are some screen shots on how their scam is executed. The best prevention is to visit sites you trust and be suspicious of any email from people you do not know. 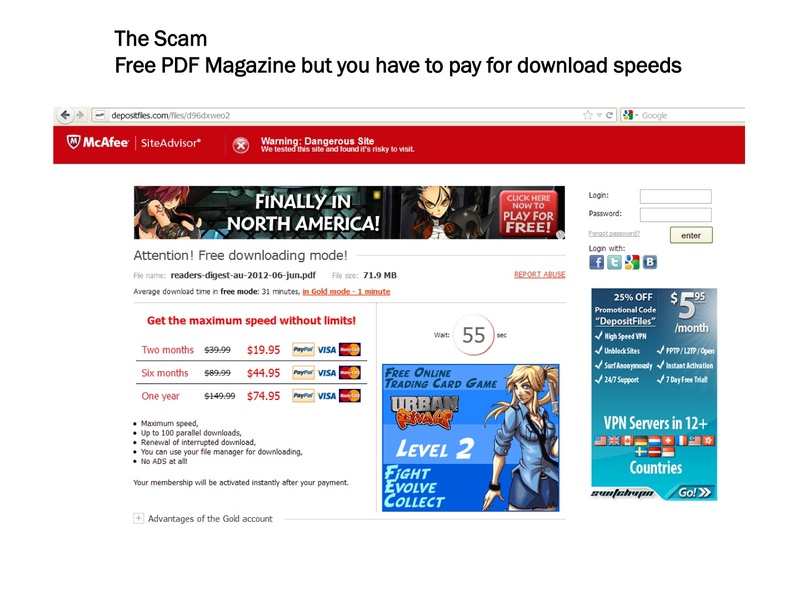 As for online scammers stealing content, hopefully their exposure will force them to desist from doing this. We know if the big publishers get involved, the site will be shut down, as this was done before with another pirate site that offered free digital magazines a few years back. “Today’s cyber criminals are more savvy and persistent than ever before,” says Paul Grossinger, group publisher at Annex Business Media, who oversees Canada’s leading security magazines, including Security Matters, Canadian Security and SP&T News. “They have one goal and one goal only: to make money." 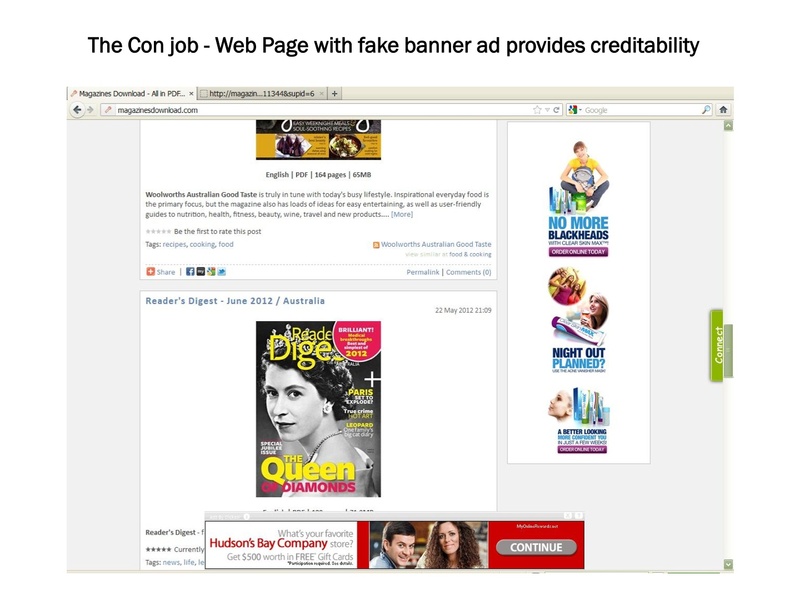 In the grey area, in my opinion, are content aggregators who take your content you give away for free online and repackage it with their own ads such as Google, Bing, Yahoo, Flipboard and Zite. In March of 2011, Zite received a cease and desist order asking it to stop “misappropriating” the intellectual property from the Washington Post, Time Warner, AP and Getty Images. Subsequently, Zite was bought out by CNN (owned by Time Warner) in August 2011 for $20-$25 million. Perhaps the answer is to buy them out like CNN did to stop this, but CNN paid a heavy price. All I can do to help the media industry to combat cyber crime is to expose scammers so nobody will go to their site as we know the pen (now keyboard) is mightier than the sword. But a denial of service attack on these websites would be a good idea, as a good offense is the best defense, or in hockey terms a good face wash into the glass will make us feel better. If you know of any scams (being mindful of libel laws, of course) please post them in the comments section to expose them is a good start. UPDATE FROM RYAN OF NERDS 4 HIRE: A note to all readers, looks like Martin was a victim of not following his own blog. On Friday evening I received a panic call from good 'ole Martin, and looks like he got click jacked while trying to locate sites that were using his blog illegally. Way to go Martin. Lucky for him I was still in my office, and able to get his PC cleaned up.